The Canon C500 is a good camera for broadcast and works great with Previzion. Other than the usual adjustments, like disabling sharpening, lowering the ISO/gain a notch below native, etc., if the production intends to use any of the 4K or 2K formats that are in 17:9 aspect ratio, make sure to adjust the sensor width to match (see “Canon Cinema Sensor Sizes” below). The C500 has an internal recording that is always in the respective frame rate at 1920×1080 resolution in MXF format, regardless of which capture mode (HD, 2K or 4K) the camera is set to. Transcoding Canon’s MXF format and preserving timecode along the way is not trivial. Make sure to try this format with your post-production pipeline before entering production. Canon’s recommendation is to actually use an external recorder such as the AJA KiPro line of recorders to properly capture footage. For 4K or 2K productions, make sure to implement the use of a supported DPX 4K capable external recorder such as AJA KiPro Quad. 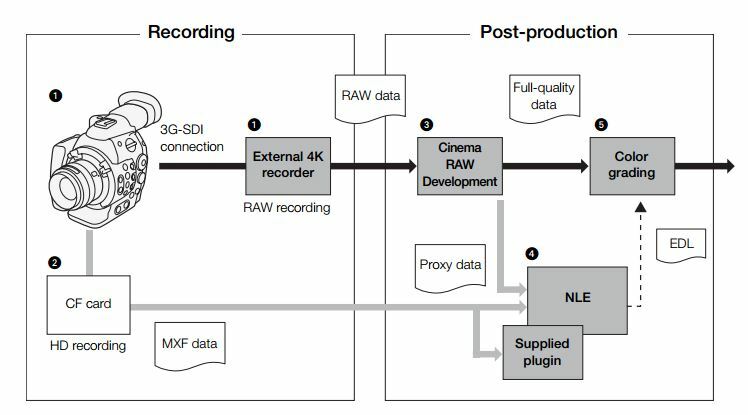 Currently, AJA KiPro Quad is capable of recording the C500’s full 4K resolution, but it does not record Preivizion’s tracking metadata (SMPTE 315M) for reperformance. Please use a KiPro or KiPro Mini for reperformance. There are a few options for connecting Previzion to the output. To avoid confusion, for everything Previzion, use HD/SD SDI instead of any of the 3G or Mon 1 & 2 outputs. When using HD/SD SDI, disable all menus from being displayed in the output (VIDEO SETUP> HD/SD OUTPUT> HD Onscreen Disp.> Off). Also, when using supported formats, the C500 SCAN MODE will have to option of being a “PsF” or “P” signal, independently set from the internal recording. Previzion can work with either. Just make sure that whatever is set on the camera is set in Previzion. 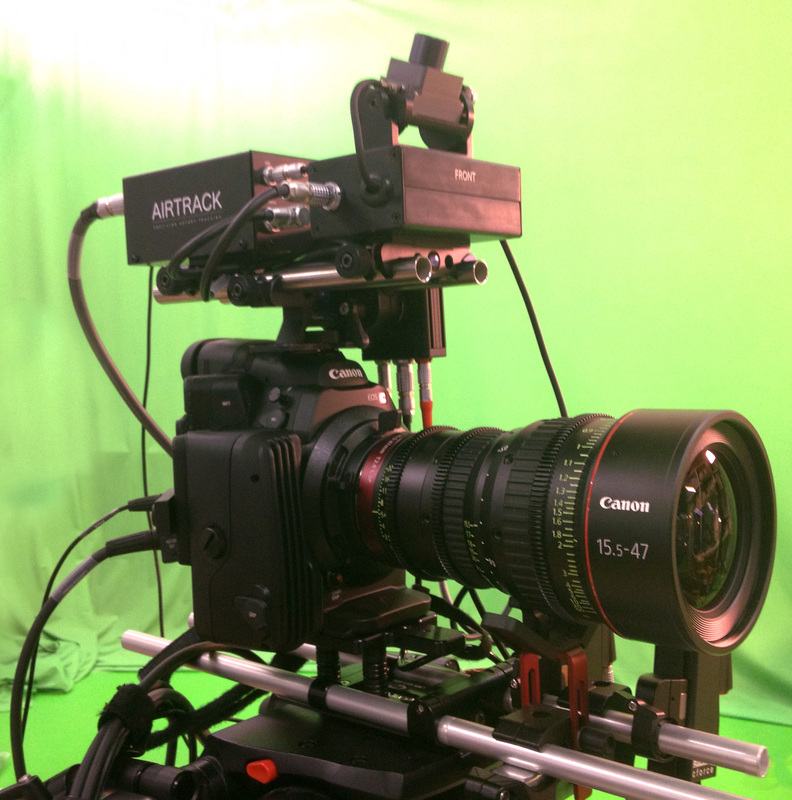 Additionally, you may choose to use the SYNC OUT from the camera as a genlock source to feed the Airtrack’s Genlock input. Simply set SYNC OUT as Output and “HD Sync” (tri-level sync) with SYNC OUT>SCAN MODE set to “P” or “PsF” to correspond with HD/SD SDI>SCAN MODE. This is not necessary, but it is an option. Canon C300 is not always recommended as a Previzion camera because of the many quirks in its output signal. If the intention is to film a project at 24fps, this is not the camera for you. However, if the show is being captured at 25.00PsF (set Prevision to 25PsF), 29.97P (set Previzion to 29.97.PsF) or 59.94i (set Previzion to 59.94i), the C300 works fine with Previzion. Just like the C500, the internal recording in the C300 is always in MXF format at 1920×1080 in the corresponding frame rate. Make sure to try using the footage in your post-production pipeline before implementing this camera in your show. Using the footage recorded internally preserving timecode and other metadata from MXF format requires some attention. Use the HD/SD SDI terminal to connect to Previzion’s input. Make sure to set VIDEO SETUP > SDI OUTPUT to HD and disable the onscreen menu from the output in VIDEO SETUP > HD Onscreen Disp. and set to OFF. The C500 does not crop into the sensor to match the pixel count of the resolution as much as it uses the same are of the sensor, but it down-samples the image. In other words, the FOV (field of view) of the 4K image in 16:9, for instance, matches the FOV of the MXF HD image in 16:9.